Those crazy kids at Adult Swim have taken their popular Aqua Teen Hunger Force and re-branded them as a team of detectives, in celebration of their 100th episode. Having said that, there’s actually no detective work going on, just a delightful slather of bizarre animated comedy involving time travel, vampires, evil tattoos, a whole lot of un-PCness and demonic creditors. 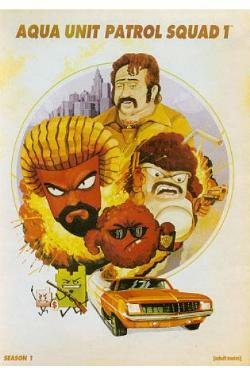 If you’re not familiar with the series, the gang is made up of the cute but naïve Meatwad (he’s a meatball – obviously), father -figure Frylock (a man with a body of a fry packet and a head of fries for, erm, locks) and the deluded Master Shake (self explanatory really). They live next door to their over-hirsute neighbor Carl. The voice talent includes Matt Berry (Garth Marenghi’s Darkplace/The IT Crowd/The Mighty Boosh) as a wrathful bringer of zappy judgment type. The last series of the original is included on the second disc if you missed it. The extras include a short film within a film (part three of a series) involving the series’ creators Matt Maiellaro and Dave Willis depicting evil person-killing mobile phones. Nice. With previously unreleased episodes and gore, gross-out humour, rampant drunkenness and nakey people, what more does one want? You may also want to have a peek at these reviews: Samurai Girls, The Expendables 2, Troll Hunter.